NEW DELHI (IANS): Maldives is committed to provide protection and legal cover to foreign investments in the Indian Ocean island nation, the new Maldivian President Ibrahim Mohamed Solih said here on Sunday. Solih arrived here on Sunday on his first state visit to India and a bilateral investment protection agreement is expected to be signed following his talks with Prime Minister Narendra Modi here on Monday. "There are no obstacles in Maldives to the full ownership of investment by overseas investors and Maldives is committed to the protection and legal cover to overseas business," the Maldives President said, addressing the India-Maldives Business Forum organised by the Confederation of Indian Industry (CII). 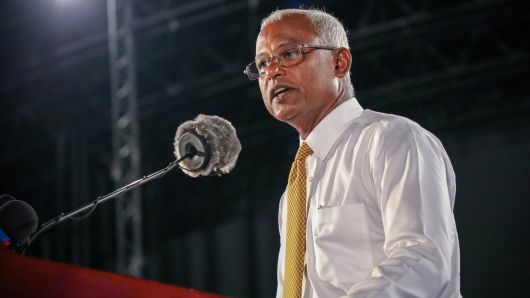 President Solih’s declaration on Sunday assumes significance as both countries seek to renew their close ties, which were briefly interrupted by the political turmoil in Maldives earlier this year. Relations between India and the Maldives deteriorated after Solih’s predecessor Abdulla Yameen imposed an internal emergency in February this year. Solih defeated Yameen in the elections in September to take over as President. The current bilateral trade is worth a little over $200 million annually, with the balance in favour of India.